Since September is National Better Breakfast Month, I thought I would take time to share my thoughts with you on the need for breakfast, and what options there are out there for dieters who are looking for a fast, easy, and low-calorie breakfast. The importance of eating breakfast can never be stressed enough, and I think it is even more crucial for those who are watching their waistlines to avoid skipping breakfast. Also, in honor of better breakfast month, horizon is sponsoring an egg giveaway on Yummy Diet Food. You may know from personal experience that rushing out the door without some type of breakfast just leaves you feeling hungry by mid-morning, and more vulnerable to eating higher calorie foods later on. Eating breakfast can help to decrease your overall intake of fat, and besides, you have the entire day to burn off what you eat during the morning! I personally don’t feel ready for the day unless I do eat a healthy but low calorie breakfast, and one of my favorite foods for breakfast has gotten a little bit of bad press lately – eggs! Luckily, not all the brands of eggs were recalled. One individual egg contains a whopping six grams of protein and nine - count them, nine- essential amino acids. One egg has just 1.5 grams of saturated fat. Some studies suggest that just one egg eaten each day can prevent or reduce the incidence of macular degeneration. This is due to the egg’s zeaxanthin and lutein, both of which are nutrients that are more readily derived from eggs than from any other nutritional source. Eggs are a natural source of Vitamin D.
One study suggests that women who ate a minimum of six eggs each week lowered their risk of developing breast cancer by more than forty percent. Eggs can make your nails and hair healthier because of their high vitamin and mineral content. While there are lots of ways to eat eggs, keeping with the National Better Breakfast Month theme, I thought I’d share my favorite low calorie omelet recipe with you. Cut your vegetables and heat them in a skillet with a teaspoon of water until they are soft. Heat oil or butter substitute in another pan over medium heat. Break eggs and stir with a fork until they are blended. 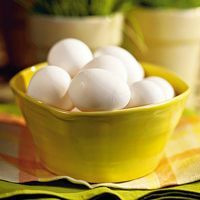 If you want to cut fat from the recipe, separate egg yolks from whites, and just use the whites for your omelet. Pour eggs into pan. Add your veggies. Cook until eggs are done to your liking Add salt substitute or Mrs. Dash and pepper to taste. This is also good with a side of salsa (check out my salsa recipe), especially if you make this omelet for a quick and easy late morning meal or snack any time of the day. I also sometimes like to combine a slice of toasted low calorie bread inside of my omelets for some added crunch. Eggs. A thing of beauty. The perfect food. Sunshine in a little white package. Filled with all that yellow creamy protein goodness. When I was a little girl, I would sit at my grandmother’s kitchen table, anxiously waiting while she boiled an egg. Three to four minutes later, Bobe would place the boiled egg in a white porcelain egg cup that was sitting in front of me. Yes! I would carefully crack and peel the top of the shell off, sprinkle a bit of kosher salt on top, and dig in with my spoon. Mmmm. Heaven. Not knowing any different, I called this gorgeous food, “Bobe’s Eggs”. When I finally discovered the actual name was “soft boiled eggs”, I defended my Bobe’s honor and declared it can’t be so! Decades later, I still adore eggs, in all of its perfection, made any which way. But Bobe’s Eggs...well, they will always hold the largest chunk of my heart.